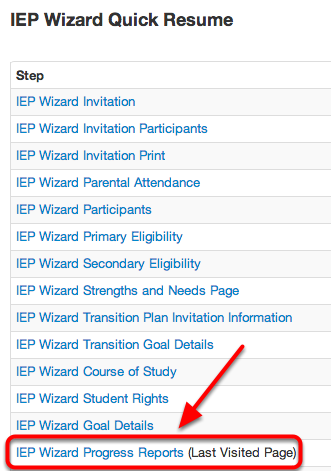 From the IEP Wizard Quick Resume Menu, select IEP Wizard Progress Reports. Indicate whether progress reports will be sent to parents at regular reporting periods by selecting Yes or No. 1. In the provided field enter how the parents will be informed of the student's progress. 2. In the provided field enter when the progress reports will be sent to parents. 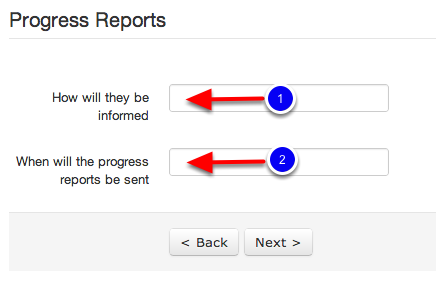 If Yes is selected indicating that progress reports will be sent to parents at regular reporting periods, you will automatically be redirected to the IEP Wizard LRE Questions page where a green dialogue box indicating, "Progress report information saved successfully" will appear at the top of the page. You are now ready to complete the LRE Questions portion of the IEP. For more information on how to complete the LRE Questions section see the, "Least Restrictive Environment (LRE) Assurances" lesson in this manual.